I first had the idea of creating a banner out of newspaper when I was looking for ecological and economical decor elements for Mama Goose's new store (for those of you new to my blog, I was a design consultant last Spring for a children's re-sale shop...check sidebar labels). Bunting, pennants, banners...whichever name you give them, are a dramatic and enthusiastic way to announce family celebrations. 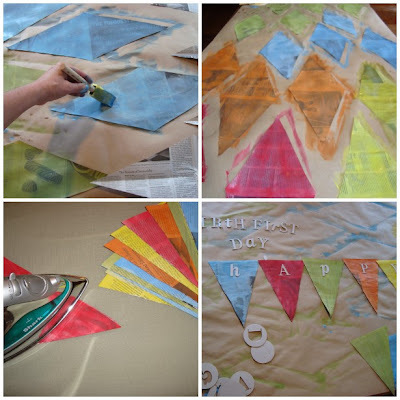 With this version of bunting all of the materials are readily available and no sewing skills are required. There are several components to this activity that lend themselves nicely to child participation. Think of all of the milestones you could celebrate with just these two messages. Hint: You only need to make one banner with two letter switches from "FIRST" to "BIRTH"! What other variations can you come up with, the possibilities are endless! Here's a simple tutorial that shows how to whip one up in the course of an afternoon. Don't forget that handy option of clicking on an image for a close up. 1. Take a small stack of folded newspaper (containing no more than three sheets ) and measure 6 inches along the fold line: mark with a pencil. This is your width. 2. Measure 8 inches down...this is your length. Now find the center, which will be your bunting point, at 3 inches from the side. Mark this point and connect the dots to find your triangle. 3. Cut on the lines and use this first set of triangles as your template for the rest. Newspaper is not folded evenly all the time. You may need to tidy up some of the sides...a paper cutter makes fast and straight cuts. 4. Unfold your triangles...into diamonds and lay them out in an assembly line on a good work surface. I began outside on an oilcloth, because it's so easy to clean-up. The wind forced me inside... brown craft paper or more newspaper are essential for protecting your table or floor. 5. Paint each diamond with a wash of color. Dilute your paint with a little water. I enjoy it being a little transparent so that you can see the original newspaper, but if you want a more opaque look use very little water. 6. Dry. Make sure to lift the paper every once in a while so that it won't adhere to the work surface. 7. Fold and iron each triangle. When it dries it curls up at the edges and bubbles. I used a low heat setting and ironed directly on to the paper. You may want to try it with a cloth separating the paper and iron...but the direct method worked fine for me...no burns! For my blog's header (above), I printed out the font and size I wanted from my computer and then cut them out with an exacto knife. This was time consuming, but I had a very specific look in mind. For the tutorial I used scrapbook letters, available in most craft stores, and was thrilled with how well it turned out...let alone the speed of adhering them with paste. 9. Now you're ready to hang it! Tack your ribbon or twine up FIRST, then arrange your bunting. Hang each triangle over the ribbon at the fold...I found it helpful to paste the inside together with a dab from a glue stick once it's complete. When not in use, the bunting stacks nicely and takes up little storage. With care, this will last for many celebrations...or recycle it and make a new one! You know how much I love to hear what you're up to, so please tell me if you try it. I'd love to see pictures, as well. this is a fun idea! i like the fabric ones because you can reuse them, but if you were having a carnival or something that you needed a LOT of them, this would be the way to go. Thanks for sharing the tutorial! I remember your original post about the newspaper bunting, and I'm so happy that you came back to it to give us a full-on tutorial. Now if only I had another lifetime to explore all of your creative ideas! Fabulous! I loved this in your banner too! I'll be linking to this project in the Daily DIY today! Oh, fun. I'm going to have to think of ways to use that at school. I wondered how you did the letters on your header...all that with an x-acto knife! Wow! Thanks for the tutorial, I've wished for a reusable birthday banner (I'm just too cheap to buy one, I think), and this should do nicely--just in time! Take care! yet another great project to add to the stack! How absolutely delightful... and practical with the newspaper! -Snippety gibbet, maybe you could enlarge them and each child could have there own triangle to design...then they'd be ready for display. Ok I was totally sidetracked by your beutiful kitchen and that breathtaking beam. I love old houses, thanks for sharing. P.S I do love the banner by the way. I love this project, especially for the first day of school. I always love having something special the morning of the first day to get the kids excited. This will fit the bill perfectly! Do you mind if I link to this on my party planning blog? I really love your blog and chose you to win a "i love your blog" award! Oh happy day! :D If you run over to my blog, you can see the little picture of it in my most recent post! :D yay! Continue with your wonderful posts and I will continue to read! I just discovered your blog - I LOVE it. This is a great idea!! I'm going to try it out soon. I'd love to see pix after you've given it a try! -pumpkin petunia-thanks for asking permission, please feel free to link to your party site. I'll e-mail you also. Great tutorial and I like how you were able to incorporate a reused item. Just my kind of craft. I'll be trying this for my daughter's 4th birthday party. Both my kids will enjoy helping to paint it I'm sure! thanks maya! i was wondering how you did this :) love those flag banners! I found you via whip up & think that these are lovely! I'll definitely be book-marking them for future use- thank you. This is awesome! I love any paper recycling crafts! 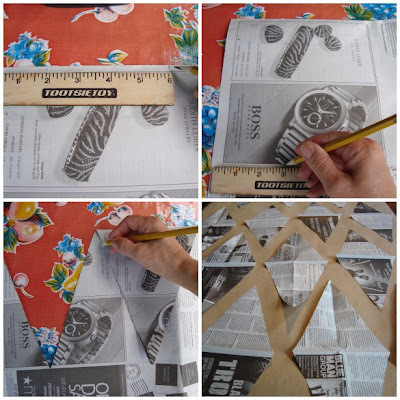 What a nice way to use news papers! Your banner is very pretty indeed! So cool! I love the fact that I now have yet another excuse to give my husband for NOT getting rid of our newspaper stack! LOL Thanks so much for sharing the idea and instructions! What a cute idea. I am doing Halloween deco's now. So I am going to do a Banner for Halloween. I will let you know how it turns out. That is so cool! I'm going to make one for my son's birthday party. I love that you are just using newspaper. Would you mind if I linked to you on my site? I'd love for my readers to see this and be able to ooh and ahh over your work. Mama Goose! A great post, AND you're from Ithaca! Get out! Your blog is great! I got bumped here from Craftzine.com. Love what you're doing, subscribing immediately! Maya, I made the bunting! It wasn't ready at the time, but now it is. I will be hanging it on thursday for Zoe's birthday, just indoors (the picnic will be had later, when we are not sick anymore, and weather joins us). I'll be posting pictures of the banner on the wall as soon as I can after the celebration. I love this! What a great, easily achievable idea! Hi there, can we link this in the next Carnival of Green Crafts? Let me know! Thanks. I made this a couple days ago for my 11 year old's birthday and she LOVED it. Thanks for the idea and instructions. Thanks for the great idea and easy tutorial! this rocks! hope you don't mind me sharing this! May I borrow the picture of the banner for an illustration I am doing? It's perfect. That looks so levely, thanks for the great, very affordable idea! These are so much fun. Thanks so much for sharing it. I love the transparency of the paint application. Very nice! Thanks for the great idea! I'm planning my daughter's first birthday soon and I'm going to need a LOT of banners. This looks more doable than the fabric version. I just posted my own version of your darling banner--thanks for sharing. I recently discovered your blog. You have so many wonderful ideas that I can't wait to try! My birthday is this weekend, and I'm going to try to make this for my party. I hope it's as pretty as yours. I love this idea, but beware if you use more paint (i.e., if you don't like the newsprint showing through), then the newspaper does tend to tear. Luckily, my 3yo is happy about trying it again with brown paper bags to make a banner for his sister's 2yo birthday this weekend! Who doesn't like an extra day of painting? Thanks for the inspiration and I'll link to the finished product! I used your idea at summer craft classes with kids, we made name banners (we didn't use newspapers, but the paper was also recycled). Landed on this while searching for DIY banner.. this is wonderful..